Circles cut with a router are usually made with some form of trammel bar, but the minimum radius possible is determined by the base of the router. For very small circles a simple solution is to make a false base plate with a pivot pin in it.This can be made from MDF or, preferably, perspex. and is attached to the router base by means of two counter-slots (made with a guide bush guide) to allow the required radius to be set. A third slot is cut to let the cutter through. The centre of the circle is at the centre of the pivot pin, so it helps if the pin is a convenient diameter, such as 6mm. You can then knock 3mm off the radius of the required circle. 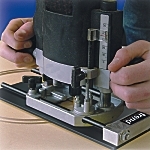 The radius can be set very accurately with a vernier gauge, but if the diameter is critical, a test cut should be made. When setting the radius, keep in mind whether it is the disc or the hole that you are cutting. otherwise you may be wrong by the width of your cutter. If you are making wheels for toys, etc, you can make a special small circle cutter with a piece of the proposed axle as the pivot pin. You will then have a wheel perfectly centred and ready to push on to your axle. For medium to large circles a trammel bar can be made of plywood, MDF or perspex. The basic requirement is simply a length of board screwed to the base of the router with a hole for the cutter to plunge through and a further hole drilled for a pivot pin at the required radius. This basic design can be improved by counter-slotting the fixing holes to give fine adjustment to the radius. This kind of flat trammel is very stable on the workpiece with no tendency to tilt. If you do not want a hole in your workpiece at the centre of the circle you can make a pad of plywood, etc, fasten it to the workpiece with double-sided tape and pivot your circle on it. If you adopt this method, tape a piece of the same material to the base of your router to keep the trammel parallel with the workpiece. If you make the centre pad of perspex, you can scribe crosshairs on it to accurately position it on the exact centre of your circle.